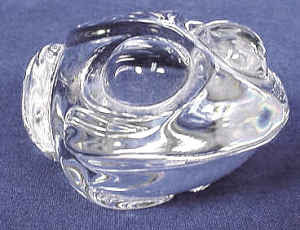 So here I was on craigslist sweat pouring from my palms sifting through the dozens of hand coolers looking for the perfect one and then, BOOM along comes the Steuben Glass Toad/Frog Figurine/Hand Cooler http://newyork.craigslist.org/brk/clt/1546568035.html . You mention that "a 'charmed' symbol of magical transformation and the redeeming power of love, the frog is also considered to be the patron of childbirth." Obviously I already knew that, but you also mention that it might be a toad, which is not a charmed symbol of the redeeming power of love, nor is it the patron of childbirth. No, the toad is a symbol rage and unemployment and the patron of genital warts. Also you mention that it may not be a hand cooler at all, but rather a figurine. I think you need to clarify because I want to be relaxing at home with hands like ice blocks enjoying the redemption of love and surrounded by new-borns, not out of a job with sweaty, greasy hands and an STD with nary a baby in sight. "rage and unemployment" ... i like that. Sounds like you really need a hand cooler...maybe you shouldn't think so hard about your choices? FYI it is a frog, not a toad, and represents charm. Anyways, we hope you are not cursed with unemployment.